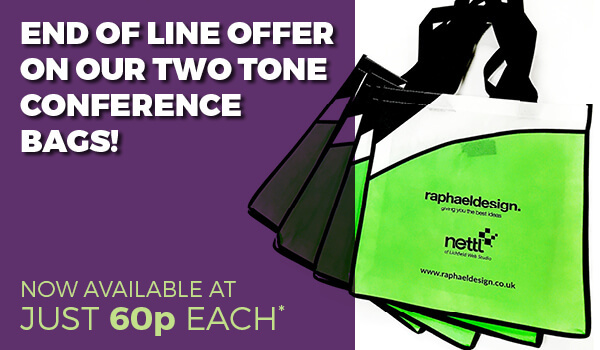 Why not bag yourself a bargain with this great offer on our two-tone conference bags! Promotional bags have always been a great way to advertise your brand and are really useful too. Especially now we all have to pay 5p for a carrier bag when out shopping. We love this two-tone conference bag and even had some printed for ourselves! However, it is now being discontinued but this means you could have some for yourself at a knock down price. At the moment you will pay just 60p plus VAT (originally £1.73 plus VAT) per bag. This price includes a one spot colour print to one position. The minimum order quantity is 100 units; the cost of origination is extra at £32 plus VAT & delivery is extra too. There is still a good range of colours still available but you need to hurry, as when they are gone they are gone! If you would like more information or like to receive a FREE Raphael Two Tone Conference Bag please send us an email or call on 01543 261220. In addition our 2016 Gifts Catalogues are available, click here to request a FREE copy.